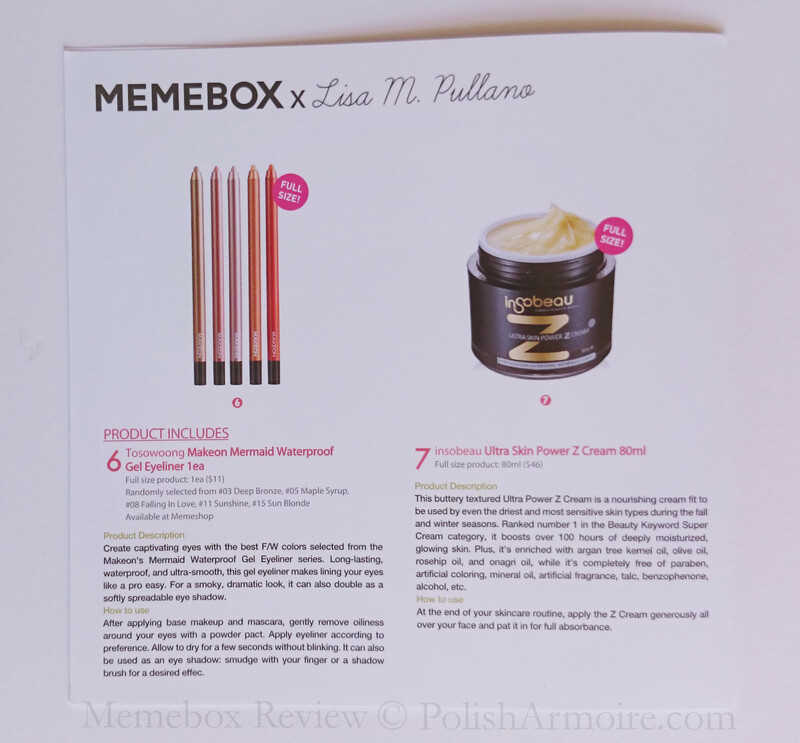 I have something a little different for you today as I recently discovered the joy that is Memebox (pronounced “me me box”). Memebox sells beauty boxes with a focus on Korean skincare and makeup and contain 4-8 full sized products and deluxe samples. Some boxes are ready to ship while others have a future ship date. The box I’m reviewing today was ready to ship when I ordered on the 11th October, was shipped 3 working days later on the 15th of October, and arrived on my doorstep a week later. The box cost US$30 including shipping though I also used the $3 account credit that you get when you sign up for a new Memebox account. The average Memebox costs the same as this one though you’ll usually be able to use one of the various coupon codes that they release every month to discount it down to a lower price or alternatively save on shipping by purchasing bundles of boxes. I’ll be explaining more about how Memebox works near the bottom of the post along with a few discount codes you can use. 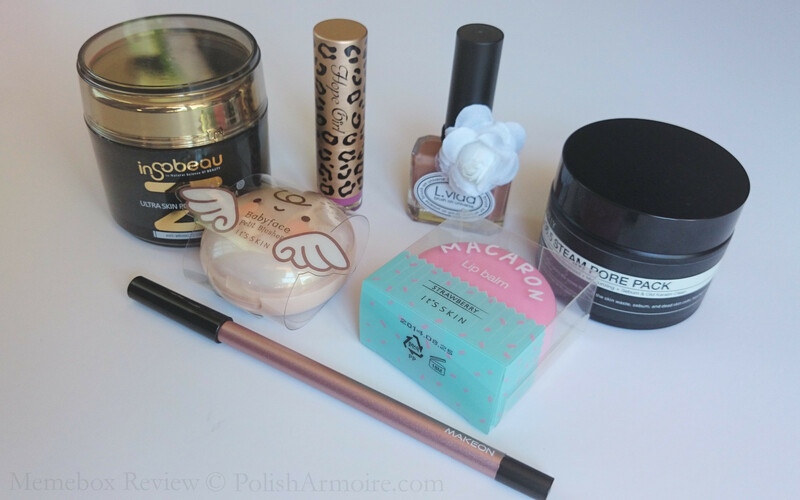 I purchased one of their beauty blogger collaboration boxes – Beauty Splurge With Lisa Pullano – because I was drawn towards what I knew was in it. For most Memeboxes you won’t know what’s in it until it arrives on your doorstep (or you sneak a peak on an unboxing post by someone who received it before you). Memebox will also sometimes reveal spoilers for certain boxes where they reveal the identity of one or two items in the box before it ships. I was impressed by how the contents were laid out in the box and I can definitely see myself resusing the sturdy box – you could even cover it with wrapping paper to create a custom storage box! Each Memebox also comes with a pamphlet that details the name, price, description and instructions for how to use each item. This is definitely helpful as the packaging of the products themselves tend to only have instructions in Korean. Click on the images below to zoom in and read the text. I’ll be reviewing each of the products received below and giving it a rating out of 5. I’ll also be assigning a personal value figure for each item which is the amount that I would be willing to pay for it based on the quality of the product (as opposed to the shade) and will also provide a price based on other store prices such as Ebay (or similar). 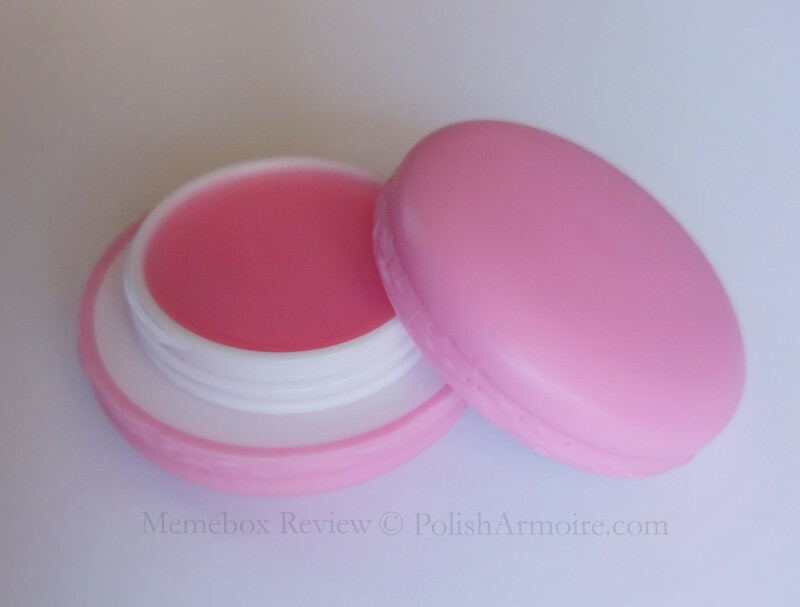 This lip balm is adorably shaped like a macaroon! I received this in the strawberry scent but purchasers of this box also had the chance to get the apple, grape, pineapple or chocolate version of this lip balm. I love this lip balm, it smells delicious and lasts a long time on the lips while keeping them nice and moisturised. It both smells and tastes like strawberry jelly! The texture of this lip balm on the lips is more akin to petroleum jelly however it isn’t very sticky and has a firmer texture in the jar which melts smoothly onto the lips. I’d give this product full marks if it came in a tube form as opposed to a pot. I’ve been applying it by swiping the balm across my lips via the pot in order to avoid using my fingers but suffice to say this may look quite strange when one is out in public. This blusher also came in Pink, Lavender and Brown but I was happy to get the peach version. 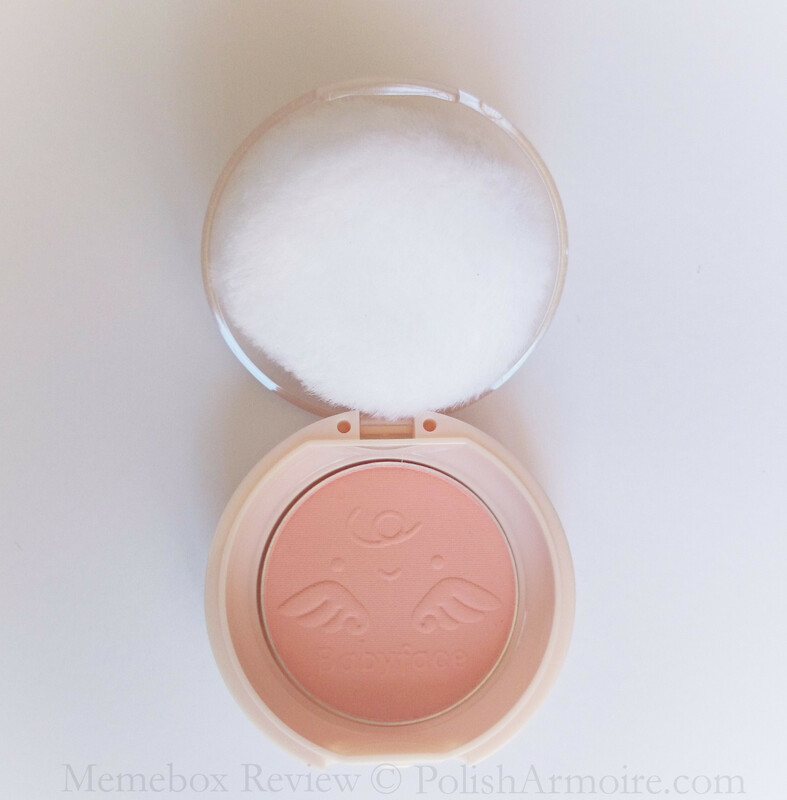 The outer packaging for this blush is adorable with the angel wings and the blush is also housed in a nice small compact. A puff applicator is included but I found that it was easier to apply using a brush. It is a buildable sheer matte blush which is very subtle on my medium toned skin and I’m guessing it will show up better on those with fairer skins. I think this is a great blush to practice with as it’s quite hard to go overboard with it. I do wish that it wasn’t as sheer though as I have to brush quite a few swipes on for the colour to show up on my cheeks. 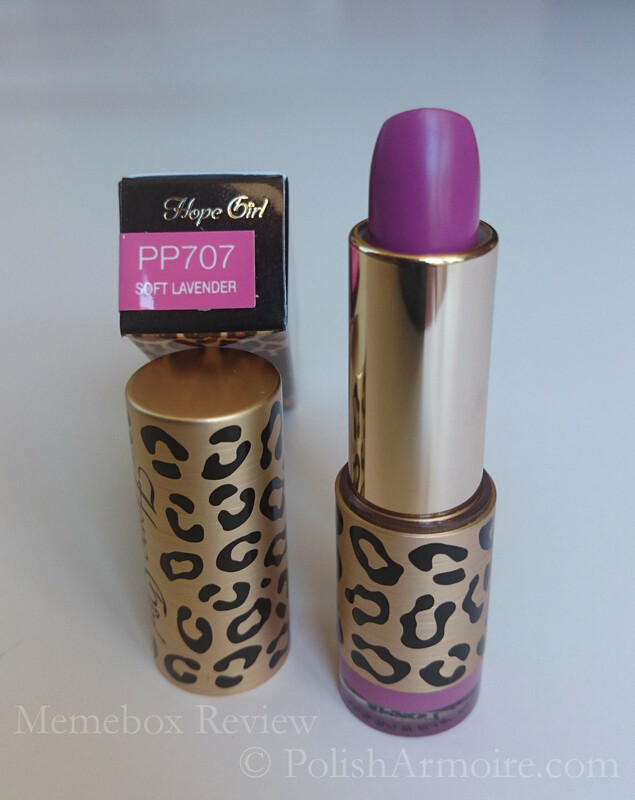 This lipstick also came in pink which I would have probably preferred as this shade is too purple toned for my taste. That being said I loved the creamy moisturising formula of this lipstick and it also contains Vitamin E. It was easy to intensify the colour to match the tube colour by putting on a few more swipes. It has a light floral scent which isn’t noticeable when swatched on the lips. I have yet to test the longevity of the formula though I’d hazard a guess that it wouldn’t be the longest lasting due to how moisturising and creamy it is. The item description claims that it lasts for up to 10 hours but I’d be dubious of this – would be happy to be proved wrong though! Don’t really dig this milk chocolate creme shade but it does have a lovely self-leveling one coat formula! It also has a nice thick brush to help with application and the flower embellishment is attached to a removable elastic band. 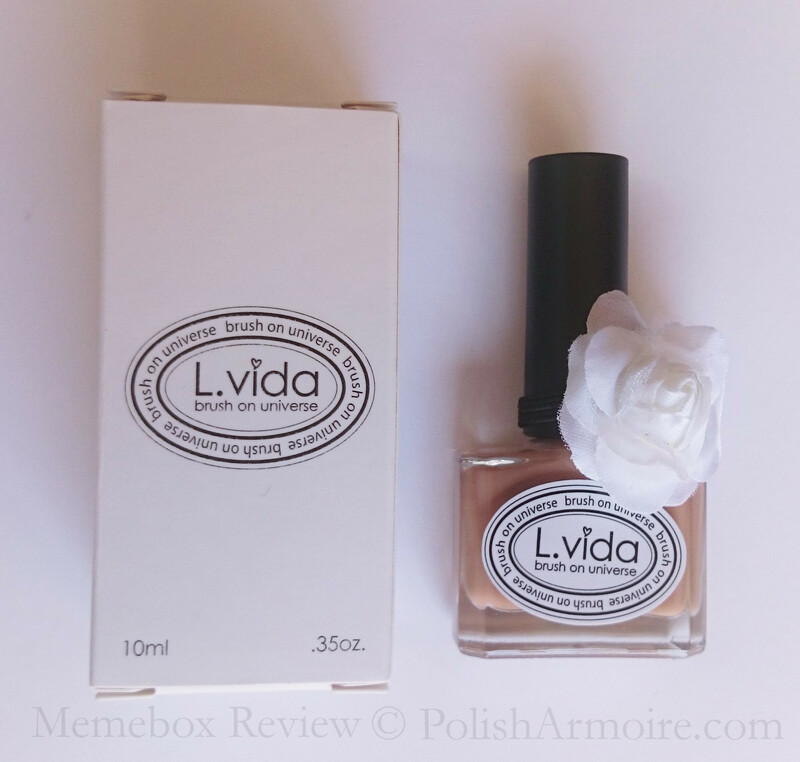 I’ve read on some other reviews that this brand of nail polish has quite a strong smell but I would say that this particular shade smells the same as other drugstore polish like OPI etc. Unfortunately my bottle had a little bit of spillage around the top of the bottle neck due to a slightly loose cap but not too much spilled. I wouldn’t mind getting this in future boxes as long as it was in a shade I liked as the formula is a winner (for this shade at least).They also have some cool glitter crelly shades like this lavender glitter crelly (photo below) that one can only hope will pop up in future memeboxes! This mask has a stretchy gel consistency that is easy to apply onto the face. It doesn’t have a scent and heats up to a lukewarm temperature upon application. The white and black granules in the mask provide a tiny bit of exfoliation during the removal process. This mask is meant to battle breakouts, excessive sebum, black and white heads and in-grown hair. It also claims to visibly draw out dirt and congestion to brighten and soften skin but I haven’t been able to observe this at all. I’ve used this twice on my face now and I can’t say that I see any visible difference but I’ll keep using the jar until its empty to see if it helps my skin in the long run. I may also try testing it on my legs to see if it really does help with in-grown hair. Until I can be sure of the effects I’m giving it a 50% rating for now. The shade of gel eyeliner that came in my box was Falling in Love although it also comes in Deep Bronze, Maple Syrup, Sunshine and Sun Blonde shades. Falling in Love is a copper-bronze metallic shade with a scattering of sparkles. Swatches below show how it looks in direct and indirect lighting. 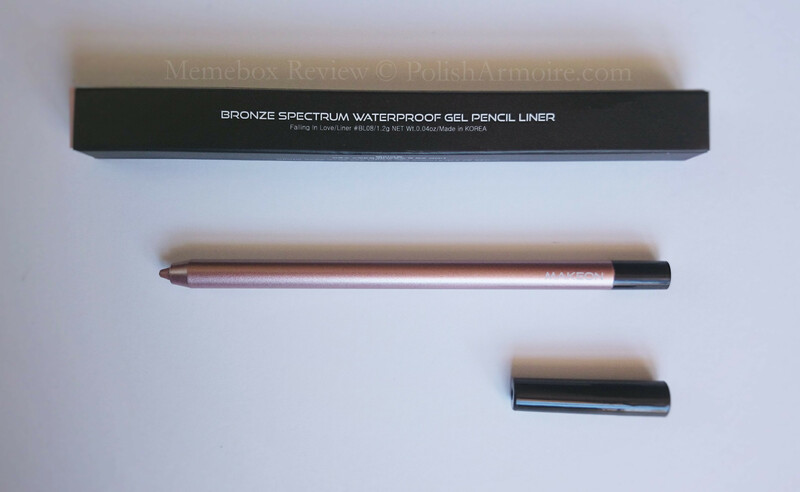 It has a formula that glides smoothly over the skin and can be used as both eyeliner and eyeshadow. It sets quickly from which point on it is rub-proof and waterproof so it pays to start smudging quickly after application if you’re planning to use it as eyeshadow. I found that I was able to rub most of the eyeliner off my eyes with a wet finger but was not able to remove the swatch on my hand using the same method. This was probably due to the fact that my eyelids were oilier. That being said, under normal conditions I would say that this eyeliner is waterproof and under dry conditions it is definitely rub-proof. This eyeliner contains a decent amount of product at 1.2g and can be sharpened to get at the product hidden in the tube. I’d definitely be keen to get this eyeliner in other shades in the future but won’t go out of my way to purchase it since I don’t wear makeup very often. I’d have happily paid NZ$10 for this eyeliner but have dropped the value down since it’s available for NZ$7.50 on Ebay. This moisturiser has a thick texture and a lemon meringue scent that sometimes verges into the territory of reminding me of lemon scented dishwashing liquid. 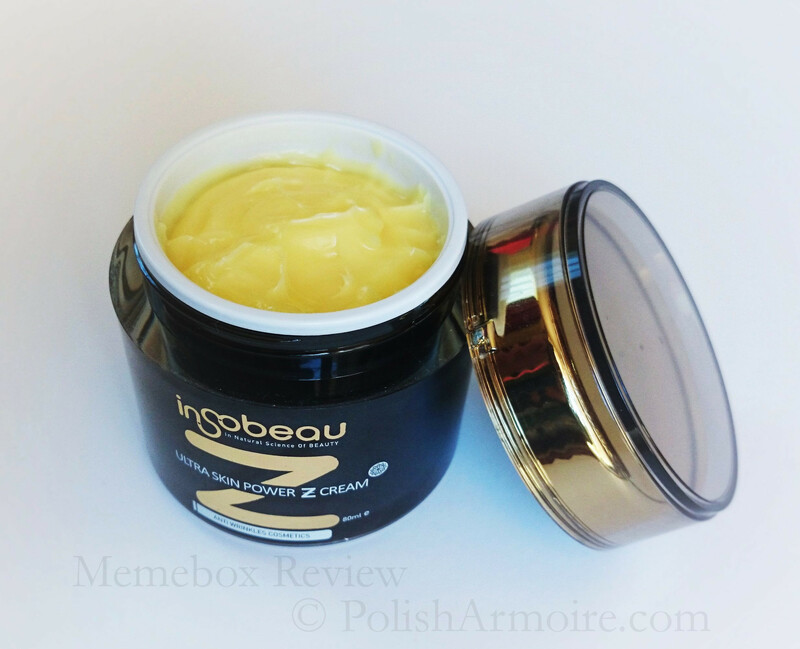 It is a heavy moisturiser that is almost too moisturising for my combination skin but would be great for those with dry skin. It contains argan tree kernel oil, olive oil, rosehip oil, and onagri oil while being free of parabens, mineral oil, talc, benzophenone, and alcohol. The best before date on this is 24th January 2015 which is odd considering the other products in this box have at least a year and a half before their respective best before dates.That being said it is definitely achievable to use up this moisturiser within two months if used daily. For those who struggle to figure out what the date means on Korean cosmetics, the manufacturing date is marked with the characters “제조” and the best before date is marked with “까지”. All in all, the tally up isn’t too bad and you can see that I definitely got bang for my buck. Aside from the price, was it worth it? In my opinion yes as I got to try a lot of different products that I normally wouldn’t have discovered without the help of this box. If you’re interested in snagging a box for yourself you’ll be able to use one code from each of the below code categories when checking out on Memebox. If you use the links in this post and/or the affiliate codes below to make a purchase I’ll also get a small commission to help fund my Memebox addiction (I may or may not currently have 10 boxes on the way O.O). If you buy 5 more or more boxes within three months, you will also qualify for Memebox VIP status (set at the beginning of each month). This will get you a variety of special discount codes to use with the best value VIP code being 20% off orders over $200. 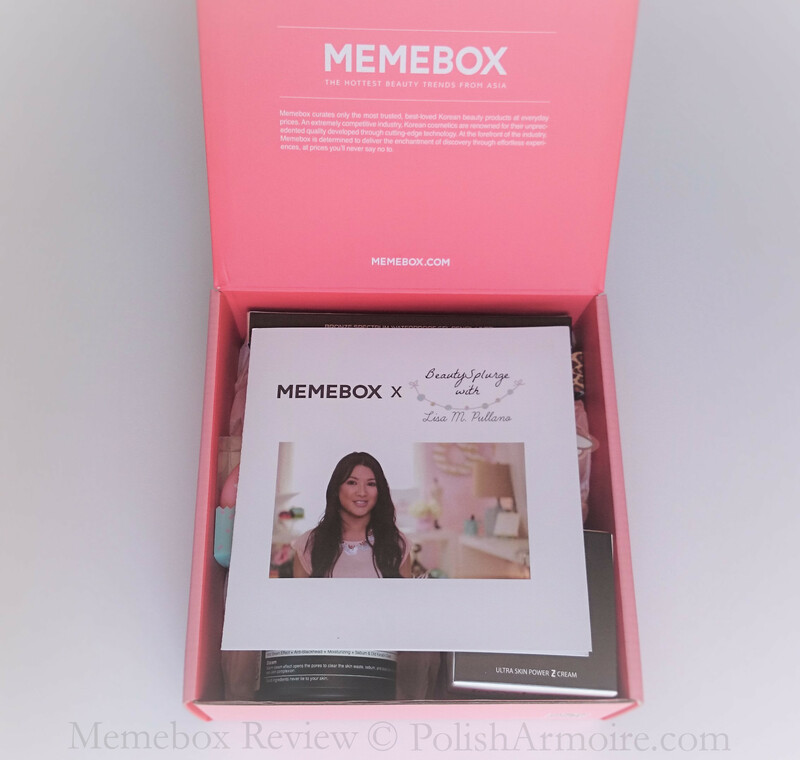 If you are a blogger or vlogger Memebox will also give $3 worth of store credit for every blog post or video that reviews a Memebox – you can find out more about this here. Global Box – This is the original Memebox series that contain a range of products that cater from head to toe. General consensus is that these tend to be the best value and more likely to be a hit than a miss. Look out for the bundles of three consecutive boxes where you can save on shipping costs – bundles are released quarterly but sell out fast. Lucky Box – This traditionally contains popular products from past Memeboxes though the last Lucky Box #10 contained some never before seen products so things may be changing.General consensus is that these are on par with the Global Box series in terms of being good value with a good selection of products. I have my eye on the Lucky Box #12-#15 bundle which would also conveniently make a good Christmas present as the first box ships on Christmas Eve with the other two boxes shipping in January and February. Themed – Will have a particular theme, for example there are currently boxes with themes such as Cleopatra, Nail Shop, Scrub Box, Tea Tree Cosmetics and many more. Super Box – Can be applied to any of the above categories with the difference being that all of the items in the box will be full sized. Value Bundles – Bundles of multiple memeboxes, free upgrade to express shipping plus only pay shipping once! Korean skincare and cosmetics can also be bought individually at Memeshop which has some great discounts on a range of products that change every week in their weekly sale. If you are lucky enough to live in the USA you will also be able to shop at the US version of Memeshop, dubbed “Shop USA“. 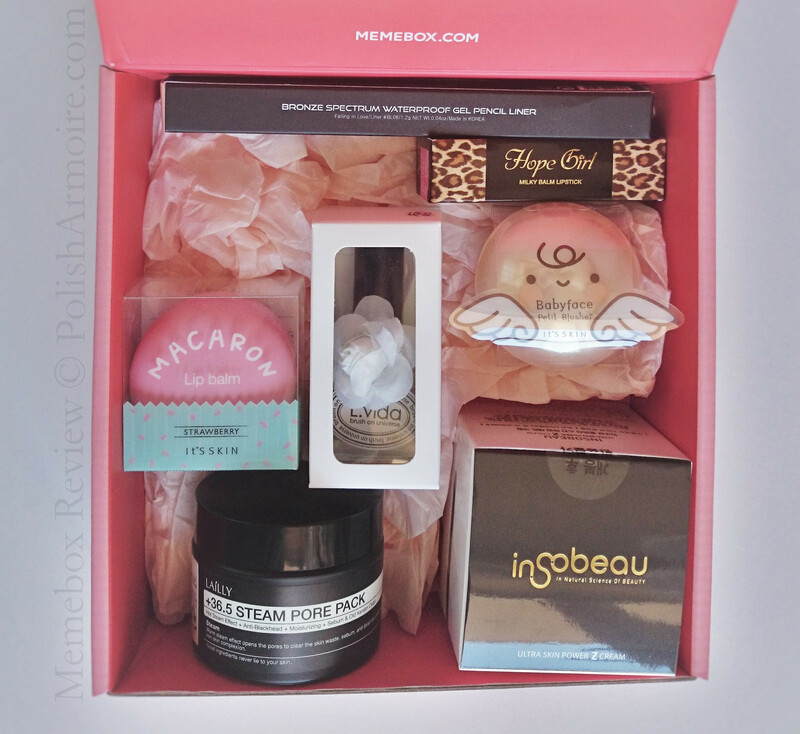 Tags: Beauty Box, It's Skin, Korean Beauty, Makeup, Skincare, Subscription box. Bookmark the permalink.